Whether you need a quality storage option for the family car or want to build the ultimate handyman's workshop, our custom-built garages offer the perfect solution. Available in a variety of styles to suit your needs and budget, our garages are proudly manufactured by Amish craftsmen and can be completely customized for your needs. 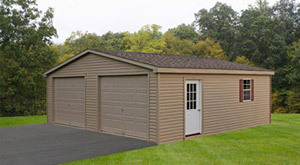 Contact Lancaster Garden Sheds today to get started on your custom garage or check out our specs and options below! 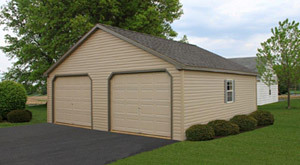 You can also see our custom garages on display at our outdoor showroom in Mount Joy, PA, convenient to Harrisburg, York and Lancaster, PA.
Our two car garages come complete with large 24" x 36" windows and shutters adding more light to your garage. 2 - 9x7 overhead steel doors and 1- 36" entry door. Upscale looks and superior performance you'll appreciate. All two car garages feature 6' or 7' sidewalls, pressure-treated skids, 2x4 floor joists and double-layered plywood flooring for added strength and durability. 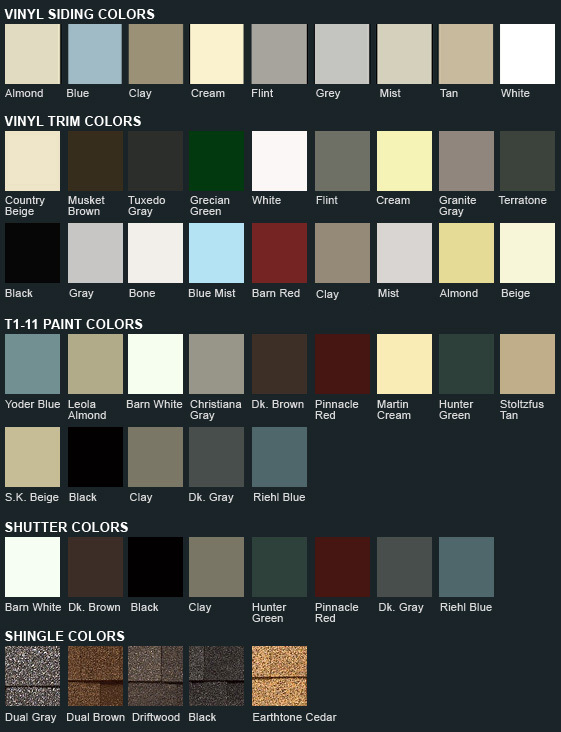 Choose from T1-11 wood siding or maintenance-free vinyl siding available in a variety of colors. 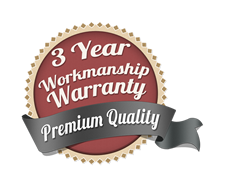 All two car garages come with a full 3-year warranty against manufacturer defects. 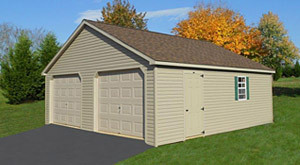 Customize your garage with ramps, extra windows, additional door options, flower boxes, shelving and more. See our complete options list here. Contact Lancaster Garden Sheds today to start building your new garage! Free delivery within 20 miles of our Mount Joy location! We deliver to the state of Maryland too!